As of 11:20 pm tonight, I have gained a total of 645 followers on Instagram and 318 likes on the transformation picture below. HOLY COW. I never thought that when I made my Instagram account, it would end up like this! 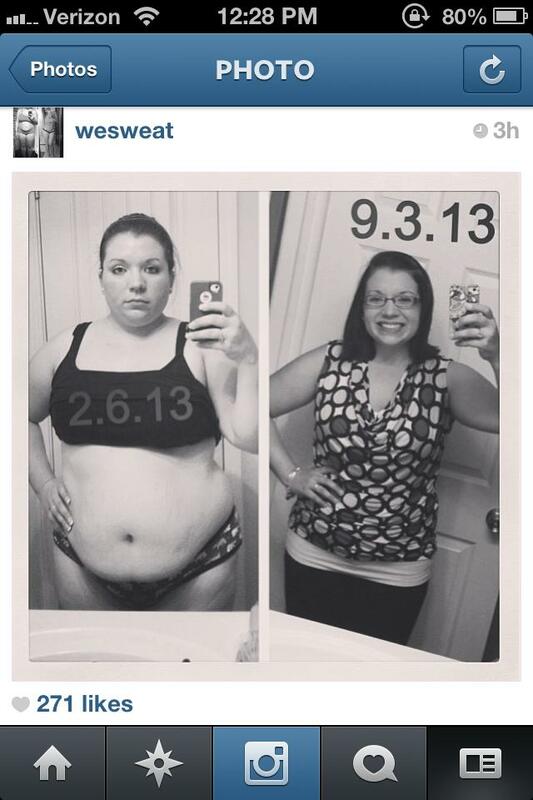 Thanks to the page titled “wesweat” they shared my transformation picture this morning and my page has blown up! So many people were commenting and asking me how I stay motivated/workout routine type questions. People were actually telling me that I MOTIVATED THEM! As far as how I stay motivated, I just think about how far I have come on this journey. It’s been SEVEN MONTHS. I have NOT stopped, sure I may have taken a day off here and there from the gym but I never let myself give up. When you believe you have the power to make a change within yourself and you want it that bad you will see results. I definitely did not start my gym routine the way it is now. (I belong to Planet Fitness) Currently I do between 10-15 minutes on the ARC trainer with a resistance of 25 and incline of 15. Then I complete the 30 minute circuit. I have to give credit to my trainer from North Carolina because he helped me perfect my circuit routine. THANKS ELAND =D You have to do what works for you. I can’t tell you what exercise routine you should complete, that’s for you to decide. All I know is the high-intensity of my one minute cardio exercises within the circuit and the weight training is successful. Now for those of you that asked how I stay motivated, I thought of some things that keep me going…. The simple fact that I never ever want to weigh what I weighed EVER AGAIN. I was so disgusted with myself and how I felt, something had to be done. When you’re no longer out of breath from walking up the stairs, you’ll want to keep going. Fitting into medium shirts and size 14 jeans! I want to look absolutely bombshell gorgeous in a wedding dress someday. It’s supposed to be the happiest day of your life so why not feel and look your best! ?